Musician’s Friend is have a great sale where you can save up to 15% on orders (or $500 off depending on final purchase value). This is available only to qualifying items. 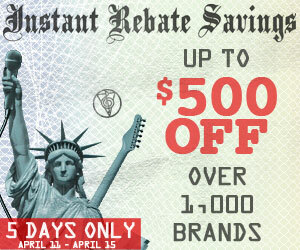 Simply use the coupon code REBATE at checkout to take advantage. For full details click here. Save up to 83% on Used Gear with Coupon Code NEW2U at MusiciansFriend.com! Exp. 7/19 Good Deal on the BBE Green Screamer at Musician’s Friend Sale on the Pro Co Rat2 Distortion Cyber Monday Coupon for Musician’s Friend!